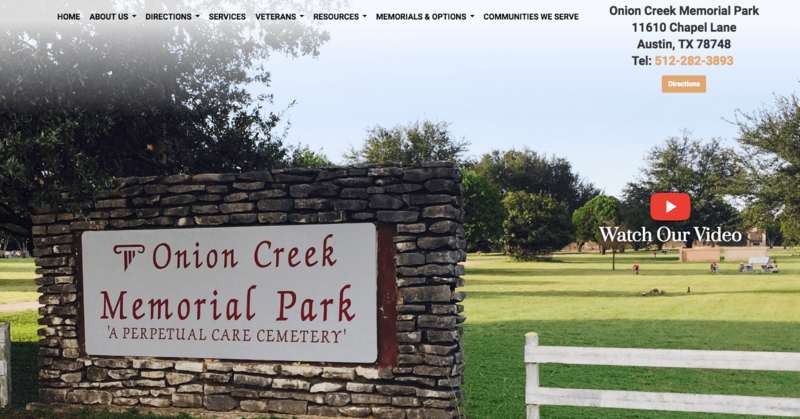 Austin Cremation All Faiths Onion Creek Memorial Park | All Faiths Funeral Services - South Austin cremation & funeral services, proudly providing families in austin affordable cremation funerals and services. Our helpful and caring staff are here to help you. Onion Creek Memorial Park is a beautiful cemetery located 19 miles south of our All Faiths - North Austin location. We provide the ability to arrange for a burial either at the time of need or in advance (Pre-Plan). It is a serene, natural cemetery surrounded by a quiet, peaceful, caring community in South Austin. They offer all types of burial options for you and your family, including full ground burial, entombment in our mausoleum and cremation niches. Our cemetery is a perpetual care cemetery, which means that your investment needs no unnecessary maintenance from you. We have a dedicated landscape crew that maintains our cemetery grounds and mausoleum. You are welcome to call us for immediate assistance. Or, visit our office in person at your convenience. Cemetery Questions? Just Ask! We'll get right back to you.